This insert is designed to be compatible with the new smaller standard of Living Card Games with boxes sized 25.4 x 25.4 x 5.1 cm. 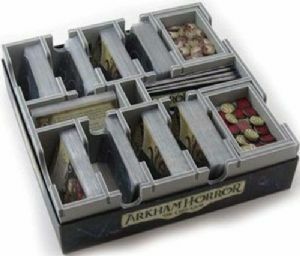 Such games include Arkham Horror: The Card Game, A Game of Thrones: The Card Game (2nd Edition), Legend of the Five Rings: The Card Game, and Android: Netrunner The Card Game The Revised Core Set, as well as with Blood Bowl Team Manager. Please check the detailed product pages on Folded Space's website for each of these games to see how to configure the insert to best work with their contents. The insert is designed to fit snugly inside the box, and is 2.5 cm higher than the box base to allow for maximum storage of cards. There is space for all cards to be sleeved with quality sleeves.